How-To.... Sort and Filter the Pokedex and Movedex! Your Blog » How-To.... Sort and Filter the Pokedex and Movedex! Pokedex: Now by Game Version! Previously, you would select a generation from 1 to 5 and you'd be on your way. Now obviously there were some flaws with that, one of the big ones being that pokemon sometimes had different movesets in different games. With the latest update you don't have to worry about that anymore, each set of games has it's own pokedex now! Another change is that there is no 'Generate Pokedex' button anymore, so what gives? Well, without this button, if you were to click on a game version, you would be immediately prompted as to whether you wanted to generate the pokedex for that game. No? The selected game version flips back to whatever pokedex version you have generated, meaning that this set of radio buttons will always accurately display which version you are using! Now lets move in to the pokedex itself! 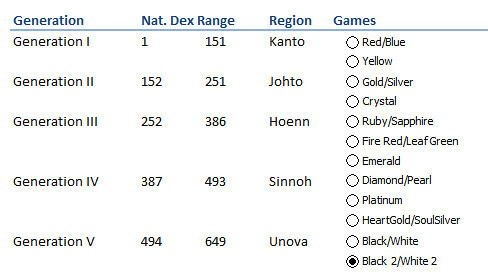 Notice that the pokedex is now formatted for easier viewing. In addition to the pretty colours, it's also got a nicer set of headers, each with a nice arrow beside it. Clicking on those arrows will bring up quite a few options, allowing you to sort and filter the entire pokedex to your pleasing. Want to find a pokemon with high attack? Go to the "Attack" column, click that arrow, and select "Sort from Largest to Smallest". Now the entire pokedex is sorted from those with the highest attack stat, down to the lowest, making it much easier to find the one you need for your party! But what if you're looking for a certain type of pokemon? Like a Dragon, for example? Simple, just go to one of the Type columns, click the arrow, select 'Text Filters' - 'Equals' and fill it out with whatever type you want! Don't want to look at Dragons anymore? Just click that arrow again and select 'Clear Filters' and bam! You got your pokedex back to normal. Well, that concludes this How-To. Got more questions? Let me know at moc.liamg|jabemllactsuj#moc.liamg|jabemllactsuj!